I was cutting up beets today, and noticed how they stain my skin. Well, I haven't worn makeup in half a year, and decided to see how I look with redder lips. And it struck me: BEET LIPSTICK! Stir together for about five minutes, either in a glass bowl, or the container you will keep your mixture in. This makes either a really great-tasting lipstick, or a powerful liquid blush. This could also be used as ceremonial paint, because baking soda takes the stain right out. If you want, you could add 1/8 - 1/4 parts beeswax for a more solid goo, but I like it liquidy. It is a lot easier to use, for me. Note: This stains better the longer it's sat, so don't be disappointed if your new batch doesn't stain your lips as dramatically as you'd like. Even an hour of sitting does a lot of good. Now, if it looks a little grainy... well, it is. The first "dose" of beet powder I added was not ground well enough. I just have to lick my lips after I've rubbed it in. I'm so proud! I'm going to experiment with different veggies to see if I can make other coloured makeups. No more metals! No more itchiness and allergic reactions! 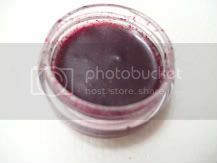 And it's easy, and cost perhaps $0.07 to make a batch of lipstick that will last me months! It took me about 10 minutes to create, not including the few hours it took for the beets to dehydrate (you can dehydrate strips made with a veggie peeler in your oven). Once again: It's only grainy because the first bit of beet powder I added was grainy, not ground enough. Yum! I could eat this stuff! I might have to give this a try. Thanks for the great idea. Sounds like undulant rhetoric to me! With no coconut butter, certainly more glycerin can be used, and that will help it to soak in before it all gets licked off. For my own purposes, I left out the beeswax because I like the stain effect. Other oils could be used as well. Ah, coconut allergies... What a horrid state of affairs! One could use cacao butter (unless, like me, you're allergic to chocolate), as you said: Shea Butter, even vegetable shortening should one be so inclined and not have access to other oils. You could even use olive oil instead of the vegetable glycerin, but I am not sure how that would change the overal mixture, as that is an important ingredient to help it soak in and give some stability. 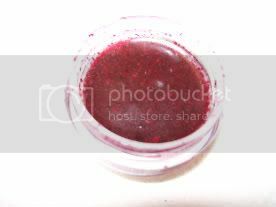 You could also use some facial lotion aside with some of the beet powder to make rouge, if someone has oily skin. A wee bit of coconut butter on my cheeks does no harm, but I know on others it would be chaos. I have stopped eating chocolate because of symptoms I was having. But I have a complex of allergic reactions that make it hard for me to ascertain whether I am reacting to the actual chocolate---or other ingredients like the soy lecithin in most bars (I am allergic to soy) or to the common dairy component---I react to the un-listed but usually high iodine content of all dairy products. I keep telling myself I must experiment with baking again with cocoa---free of soy or dairy to see what happens. I love green colored eye products---but every single boughten version sets my eyes itching like crazy. So do let me know how that experiment works out! I know that you can boil certain onion skins to get a very bright yellow or orange shade dye...don't know how that would help in the way of natural makeup, though. Then again, blending the right reds and yellows can give you a nice gold color, or more earth-tone browns and bronzes. I bought a book recently called The Gourmet Paper Maker - Handmade Paper from Fruits and Vegetables by Ellaraine Lockie. This is giving me some great ideas for colours. Oh my... SEAWEED!!! I already have dried seaweed! Nori would make a great green, and nori would make a reddish-brown! Does anyone know if there are any adverse reactions to putting seaweed on the eyes? Broccoli makes an interesting seafoam-green colour when turned into paper. I imagine it would be about the same in a cream. Pumpkin shells dried would make an interesting orange. They are strongly coloured, and butternut squash also stains very dramatically. Now, since these are all organic ingredients (organic meaning plant-derived) it stands to mention I am making small batches, and if any of you happen to make these, I urge you to do the same. This stuff should keep for months, but it may not all be used up in that time. I know that a commercial facial mask I used recently had seaweed in it...it's supposed to have stuff in it that helps tone and firm the skin...I think. I've never heard anything about it...but then again, my herbals have been limited to essential oils. [quote="Crazy Healer Lady"]I bought a book recently called The Gourmet Paper Maker - Handmade Paper from Fruits and Vegetables by Ellaraine Lockie. This is giving me some great ideas for colours. The only thing I can think of is me...being medically sensitized to iodine, which seaweed has prodigious quantities of. Otherwise, I would think it would be a healthy thing for most folks. Too many injections of iodine based dye for specialized imaging made me react badly to iodine in any form, even tho it is necessary for healthy metabolism. Thus, I will live near a coast for life----where small doses in most soils will ensure I don't have metabolic problems; since supplementation is too heavy a dose and results in bad reactions. II would like to suggest if I may, for organic colors, research Native Americans' they used paints made out of Bark and all that with alittle tweaking here and there you can make them into makeup, Sounds so awesome CHL, I can't wait to try it, I don't wear red beetish colors tho, My skin tone is not right for those kinda colors, so I'll have to experiment and see what I can do to tone it down or up a bit. Perhaps they would! Although I've learned I need something that will stain on its own, like beets or squash. I tried the seaweed thing, and although it smells very yummy, it just comes as bits of shiny green, not at all what I was hoping. It would be neat for anyone who likes metalic glitter, but... Fail. Does Lime zest do the same thing as Orange zest? Because I've noticed once in a while, if I get just the orange part of the peel, not the white part, it colors my fingers orange-ish. This is awesome, I never wear make-up, but I could be interested in this!